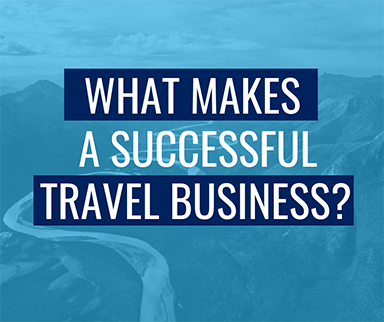 What Makes a Successful Travel Business? Financial Stability. One of the questions I often get asked is what sales level should a person reach to have a “successful” travel business. That’s a hard question to answer because every business owner’s goal is different. But the number I usually share for people getting into the business is that at a minimum they should reach $100,000 in the first year or two in business. Think about it: the average commission on bookings is between 10% and 12% because not everything in bookings is commissionable. That means $100,000 at 12% generates $12,000 in commission. If you are generating $12,000 in commission, the business can’t pay its bills and pay the owner a salary. Of course, no business is financial stable from the first day. There is a ramp-up period where the business is growing and is spending more than it is bringing in, but that should be a short-term situation. As the business gets on its feet, financials become more stable. That’s how things should work, anyway. So, the goal is to sell enough to pay the bills and pay yourself a salary. And that’s very possible, but you have to be strategic about it. Balance. We just talked about sales and, of course, sales and the amount of commission generated matter, but simply working more hours isn’t the road to a successful business. There are lots of agents who are working long hours every day of the week. That’s not balance. That is exhausting and unsustainable. You can work hard AND play hard. A lot of travel agents think that to make more money they need to work a lot more hours and that simply isn’t true. You have to work smarter, not just harder. A travel business doesn’t have to be an all-consuming endeavor. Rewarding. For goodness sake we work in TRAVEL: the most fun industry out there! You should love what you do and find it to be rewarding. If you don’t find what you are doing rewarding, it’s time to do something else. That doesn’t mean close your business and find another job, it means change up what you’re doing. If what you are doing isn’t working, why continue to do it? And you should be traveling! I know lots of travel agents that don’t go anywhere because they can’t afford to. Sure, there are times when you can’t afford to do ALL the travel you want, but if you aren’t traveling at all, that’s an issue. There are lots of other things that people can add to this list and I encourage you to add your own. Perhaps it is important for you to use your business to give back to the community. Or maybe you are committed to serving a particular demographic or group of people. Whatever the situation, the business should contribute to that goal. The bottom line is that success is defined by you. Only you know that recipe that combines to bake up success for you and your business. But have you actually written down that recipe? You need to. Otherwise, how will you know if you’ve met your goal? And how will you know what tweaks the recipe might need? It is so easy to get busy working “in” your business that you don’t focus on working “on” your business. Don’t make that mistake! Define success for yourself and be strategic about achieving it.